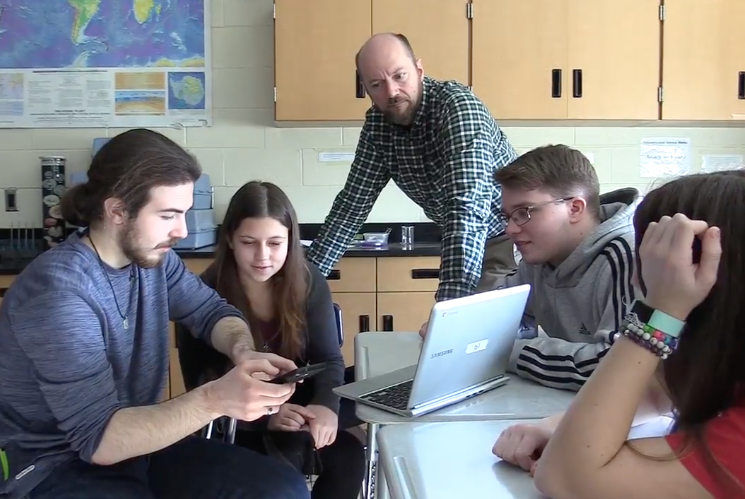 Four Neshaminy High School stu­dents trav­eled to Harrisburg January 8 with Environmental Science teacher Brian Suter to present their con­cept for a spot­ted lantern­fly edu­ca­tion­al mobile app. The group won a Bucks County hackathon com­pe­ti­tion held at the Bucks County Intermediate Unit in Doylestown recent­ly which earned them the trip to the state com­pe­ti­tion. Four Neshaminy High School stu­dents trav­eled to Harrisburg today with Environmental Science teacher Brian Suter to present their con­cept for a spot­ted lantern­fly edu­ca­tion­al mobile app. The group won a Bucks County hackathon com­pe­ti­tion recent­ly which earned them the trip to the state com­pe­ti­tion. In this video the describe their app, which they will have the chance to ful­ly devel­op the app if they win. The goal of the app is to edu­cate Pennsylvanians about the threat the spot­ted lantern­fly pos­es to trees, land­scap­ing and crops in the Commonwealth. The species, native to Asia, was acci­den­tal­ly intro­duced to the area in 2014 and has since spread to much of east­ern Pennsylvania and south­west­ern New Jersey. Unlike the most­ly benign stink bug, anoth­er inva­sive species, the lantern­fly can quick­ly envel­op and kill every­thing from grape vines to trees. For the Bucks County com­pe­ti­tion, the four Environmental Science stu­dents cre­at­ed a con­cept and cod­ed a ‘wire­frame’ of the app to demon­strate what they hoped to accom­plish. It includes games for chil­dren (includ­ing a car­toon char­ac­ter, Charlie), maps of affect­ed areas in the users vicin­i­ty, ways to report sight­ings, and infor­ma­tion on how to remove the bug. If they are suc­cess­ful at the state lev­el, they will have the oppor­tu­ni­ty to com­plete devel­op­ment and intro­duce it to the pub­lic.